1. MATERIAL: Aluminum alloy 2024-T3511, per QQ-A-200/3, OP aluminum alloy 7075-T73511, per QQ-A-200/11 (see part numbering). 3. MARKING: Ink stamp MS20001 (dash number) regular intervals along length of hinge so that any three inch length will have at least one complete identification in figures not less than .060 inches high. See note 5. 4. 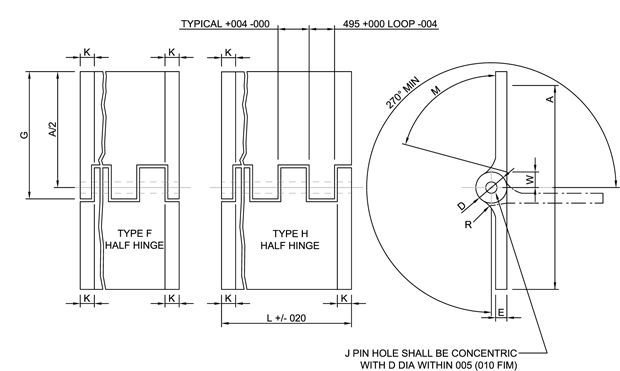 Complete hinges shall be furnished as an assembly with CAD plated CRES hinge pins of the same length in accordance with MS20253 Unless titanium hinge pins in accordance with MS28253 are specified (see part numbering). 5. Designation for anodizing, chemical surface treatment, hinge style, and length shall not be included in marking. 6. Only complete hinges to be stocked by services. 7. Use MS20257 hinge whenever load requirements permit. 1. Dimensions are in inches. b. “P” for anodized finish, “C” for chemical surface treatment, omission of code letter will indicate bare finish. c.	“H”, “X”, or “Y” to designate half hinge style, omission of code letter will indicate complete hinge. 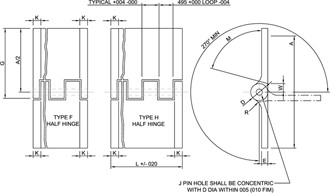 d.	“A” for 7075-T73511 aluminum alloy hinge, omission of “A” will indicate 2024-T3511 aluminum alloy. e.	“T” for titanium hinge pin (for complete hinge only); omission of “T” will indicate cadmium pasted CRES hinge pin. 9. Do not specify “P” for anodize if hinge is to be spotwelded. 10. Referenced documents shall be of the issue in effect on date of invitation for bids, or request for proposal except that referenced adopted industry documents shall give the date of the issue adopted. 11. For design feature purposes, this standard takes precedence over procurement documents referenced herein.